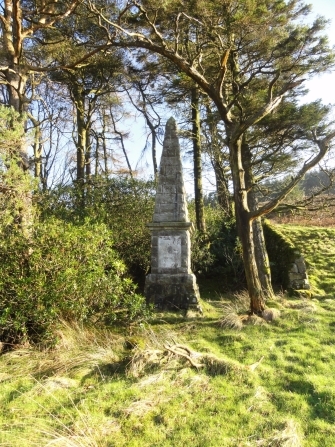 The tall obelisk and small gravestone is located in a small wood to the west of Kirkconnel farm, just off a rough track. To the memory of these martyrs. being a stranger, was interred in this spot. Robert Grierson of Lag was in the area, looking for Covenanters. He instructed his men that everyone they met be stopped and questioned, all houses come across on their way searched and all possible hiding places checked out. He knew that some rebels he sought were in the vicinity as it would have been impossible for them to get far during the night. They hadn’t gone far and were crossing Kirkconnel Moor when the fugitives, five in number, were spotted by some of the troops who found them attempting to hide in a rocky outcrop just over the hill from Lairdmannoch Loch. Knowing the uselessness of trying to outrun mounted troops, the Covenanters surrendered to Lag hoping for quarter but not asking any. They were found to be David Halliday from Mayfield, John Bell of Whiteside in the parish of Anwoth, Robert Lennox from Irelandton in Girthon, James Clement and Andrew McRobert. Both Bell and Halliday were wanted rebels with high prices on their heads. By far the most important of the Covenanters was John Bell. He was the stepson of Lord Kenmure and a man of some substance in the area. He was socially Lag’s equal if not, in fact, his superior and this fact was not lost on the Royalist who was a notorious snob. He and his kind had been pursuing Bell for several years without success. The Covenanter was the proprietor of Whiteside estate in Anwoth parish, and was a man of great prudence and religious scruple. He had been so disgusted at the behaviour of Charles II that he had joined the Rising that ended disastrously in the Battle of Bothwell Bridge. For the next six years he was a wanted fugitive. His home at Whiteside was taken possession of by Graham of Claverhouse and all his horses, furniture and moveables stolen. In 1681 Claverhouse again quartered his dragoons there until all of that year’s fodder had been eaten up by his horses and the sheep eaten by the men. The crops were gifted to the local curate who accepted them with alacrity – a move he was to regret in due course when this greedy act marked him as a collaborator of the Persecutors. Bell had a number of lucky escapes before he was captured on Kirkconnel Moor. However that day his luck ran out. Knowing full well that Lag intended to kill them, Bell asked for a few minutes to make his peace with his God, but this was refused by the Persecutor even though Colonel Douglas tried to intercede on behalf of the condemned men. Lag swaggered over to John Bell and said to him, “What the Devil! Hae ye not had time enough for preparation since Bothwell!” He took a pistol from his saddle holster and pushed the muzzle right up against Bell’s heart. With a sardonic leer upon his face he pulled the trigger and sped John Bell to his Maker. That was the signal for the butchery of the others to begin, and as they knelt on the ground trying to pray they were massacred alongside him. Lag forbade the burial of the corpses and they were ordered to be left on view to deter others from supporting the Covenanters.. Eventually their friends were allowed to carry the bodies down to consecrated ground. Bell was buried in Anwoth churchyard, Halliday in Balmaghie, Lennox was buried in Girthon and McRobert in Twynholm. 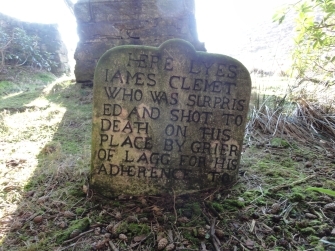 James Clement was a stranger to the area and he was buried where he fell. ‘Old Mortality’ provided a stone over his grave.